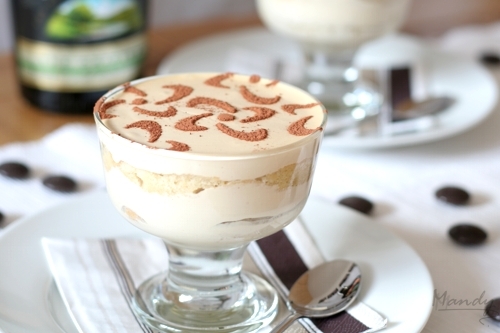 Baileys Tiramisu — What the Fruitcake?! I absolutely love Tiramisu, it's quite simple but has you wanting more with each spoonful, so when the Daring Baker February '10 challenge was announced I was really excited that it was Tiramisu. Normally I'm quite happy to have "plain" Tiramisu, but seeing as we were given freedom to choose any flavour we wanted, I thought I'd go ahead and mix things up a little bit. I'd first settled on doing a Bailey's Tiramisu as well as a Frangelico version, then later also created my Blue Rinse Tiramisu flavoured with lavender and Earl Grey tea. A big part of the challenge was that we were put to the task of making Tiramisu from scratch. That meant making the mascarpone and boudoir biscuits ourselves. 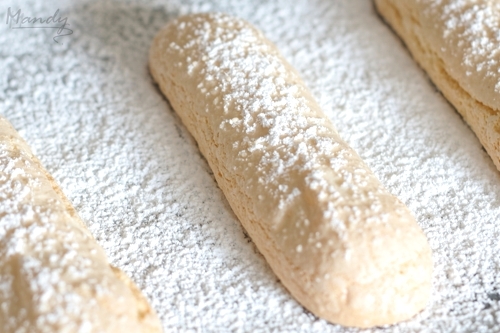 I'd never thought of making my own lady fingers before, to be honest, I expected them to be a bit complicated. Turns out I was very wrong! They were a breeze to make and I was absolutely thrilled at the fact that they tasted exactly like a store bought variety, although they weren't hard and crisp, but instead had a lovely soft and spongey center. The great thing about making your own savoiardi biscuits is that you can make them the perfect size for your dish or individual serving glasses, I also found that them being softer was great 'cause I ended up trimming them with a pastry cutter to fit my glasses nice and snuggly. The one thing about the Daring Baker challenge was that the recipe itself was a bit unusual, I'd never seen a Tiramisu recipe that used so little mascarpone and included a pastry cream. I decided to do a little bit of research on the origination of Tiramisu and came to the conclusion that either there is too little known or too many theories. If that makes sense. Some recipes include raw egg, some use cooked egg, some use none. The type of alcohol is also different depending on the recipe, if it includes alcohol at all. Whether you use a zabaglione or a raw beaten sugar and egg yolk mix also varies. Basically, there are a lot of Tiramisu recipe variations and I think it comes down to using the one that suits you. I have a tried, tested and favourite recipe that I normally use to make Tiramisu, but seeing as I was trying out a new recipe for the DB challenge, I thought I'd use two other recipe variations for the Baileys and Frangelico versions so that I could compare the end results. For my Baileys Tiramisu I decided to adapt a Gordon Ramsay recipe which doesn't contain any egg at all. I was curious to see how it would differ to a recipe containing egg. I found that it was light and smooth, almost like a mousse. I'm not sure if I over folded/mixed it, but it had a thinner consistency than the mixtures for the Blue Rinse & Frangelico Tiramisu, so the top settled to a perfect smooth surface, which I didn't mind, it gave me an excuse to pull out the stencils ;) You could always use a double cream to make it thicker. Oh, by the way, I made mine quite... um... boozy ;) so if you would prefer it a little more on the tame side, decrease the amount of Baileys in the recipe to 3 or 2 tablespoons. 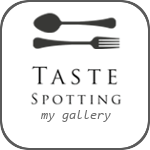 Posted on February 28, 2010 by Mandy Mortimer and filed under Sweet and tagged Baileys Boudoir Cream Lady Fingers Mascarpone No Egg Savoiardi Tiramisu.